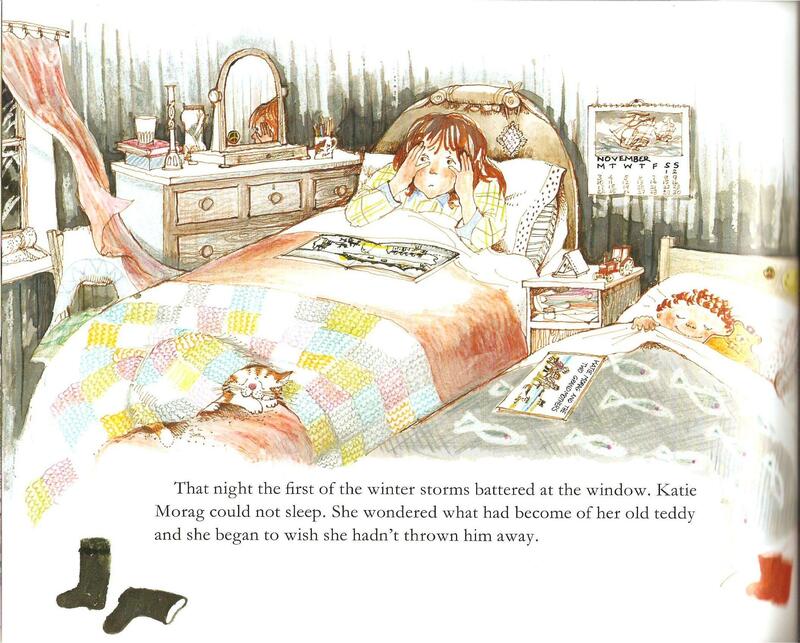 This is Tessa the Teacher by Felicity Brooks, illustrated by Jo Litchfield (Usborne, 2006). 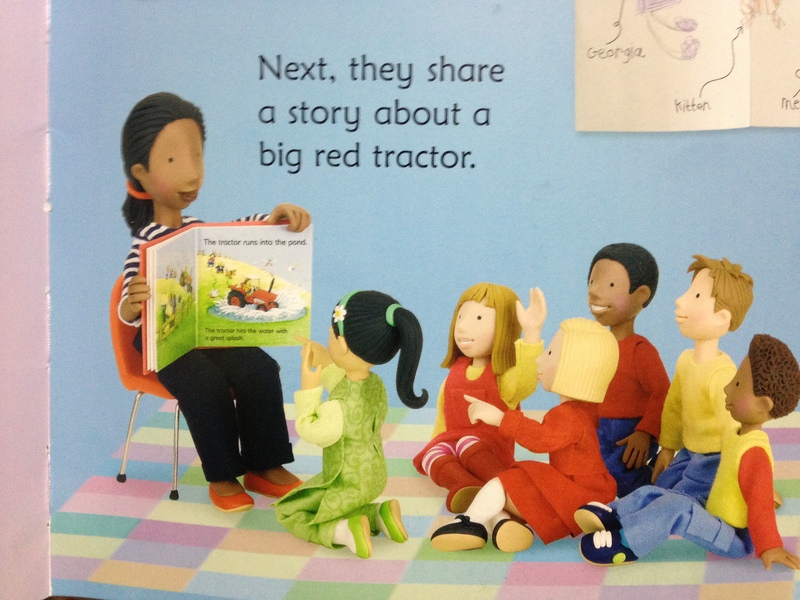 Tessa – “(Miss Thompson to the children)” – is reading to her class. It’s clearly visible as The Runaway Tractor by Heather Amery & Stephen Cartwright, from Usborne’s charming series of Farmyard Tales. Good choice, Miss Thompson! Emily Gravett’s Matilda’s Cat (Macmillan, 2013) doesn’t like bedtime stories (among several other things). 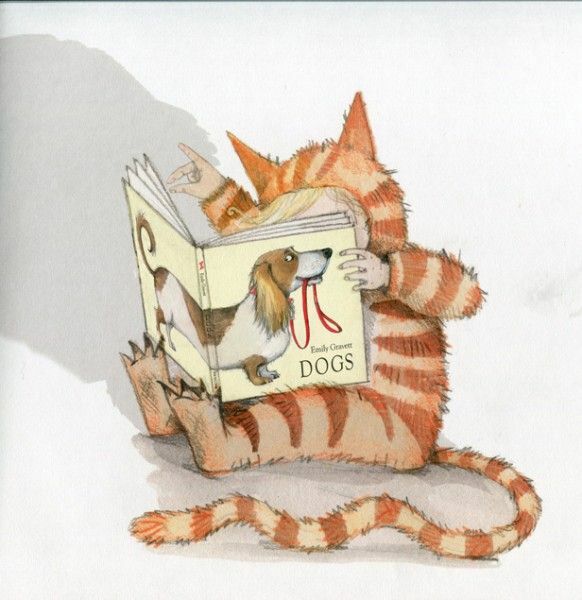 This is understandable when the bedtime story is Emily Gravett’s Dogs. . Thanks to Jenni for spotting this! 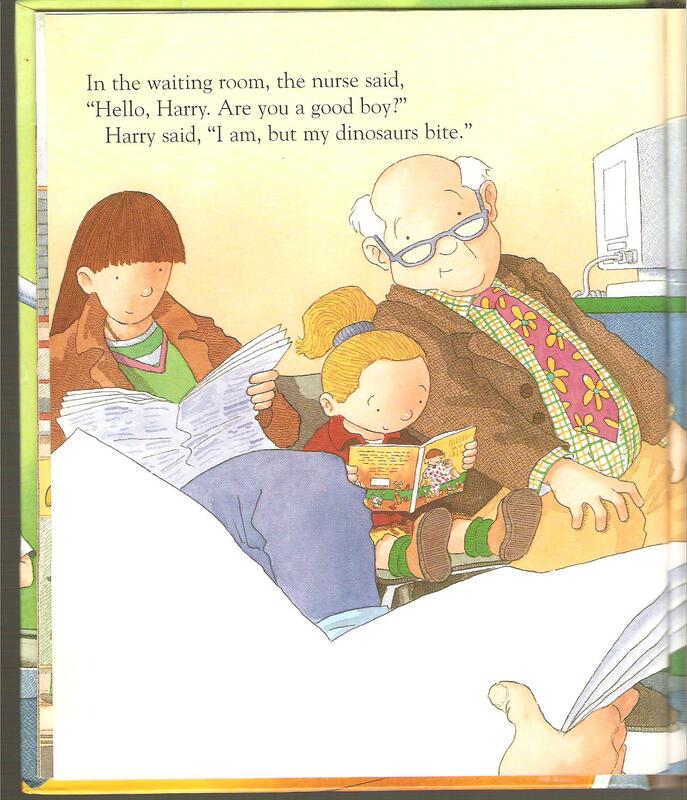 This is Harry, star of several picture books written by Ian Whybrow with illustrations by Adrian Reynolds. A few adventures in, Harry found a bucketful of dinosaurs in his attic, and ever since then the stories have been all about Harry and the Dinosaurs. 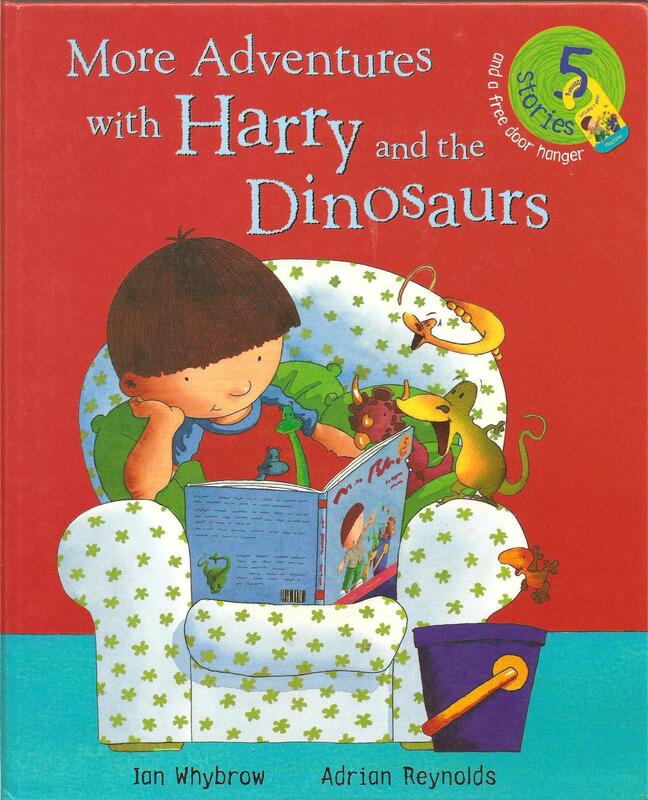 On the cover of the omnibus More Adventures with Harry and the Dinosaurs, Harry sits in an armchair with his dinosaurs, reading the first omnibus, Harry and the Dinosaurs and the Bucketful of Stories. 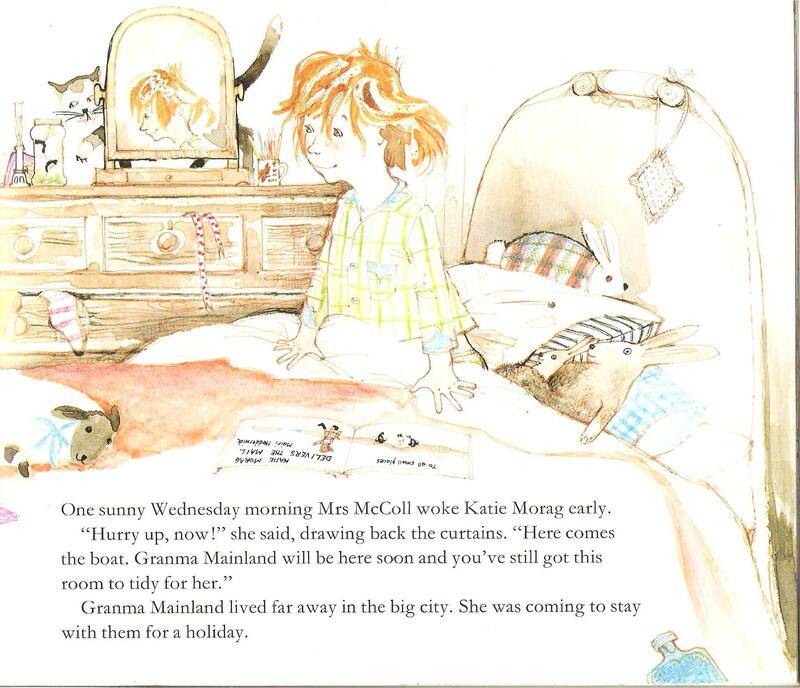 The illustrations in Mairi Hedderwick’s spirited Katie Morag books are full of detail, down to the cheeky inclusion of Katie reading her own stories. Above, in Katie Morag and the Tiresome Ted, Katie has open in front of her what can be identified as Katie Morag Delivers the Mail, with Katie Morag and the Two Grandmothers closed on her brother’s bed. In Katie Morag and the Two Grandmothers itself, Katie can again be seen reading Katie Morag Delivers The Mail.